Unique features: The Zi Jin Hall, which is ordaned in the Luxurious Style of the ancient Imperial Palace with its Grand View Terrace, that can accomodate some 60 to 80 persons for an outdoor party with views of the magnificent Forbidden City Palace Museum. More Information, coming Soon ! 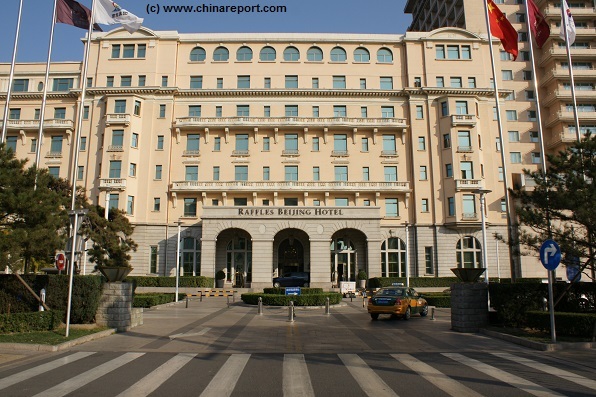 Welcome to China Report's Digital Introduction to Beijing Hotel at the corner of East Chang An Avenue and Wanfujing Dajie' in Beijing. The Beijing Hotel was established in the year 1900 AD and is an Hotel with History and Grandeur of considerable reputation. Views of the huge Main Entrance of the exclusive Beijing Hotel on East Eternal Peace Avenue (Dong Chang An). 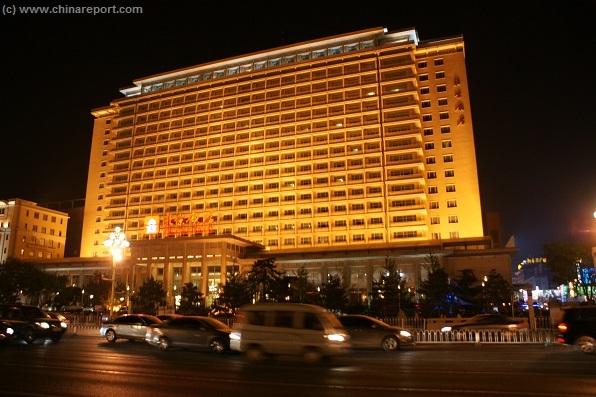 The Beijing Hotel is easily located at the corner of Wanfujing Dajie' Beijings' Number One Shopping Street and East Chang An Avenue, the widest boulevard in Asia, which leads up to TiananMen Square and the Tian 'An Men Gate. The Beijing Hotel is Beijing's Oldest and most Famous Hotel. 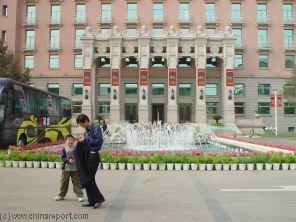 The foundations for the First Beijing Hotel, the Grand Hotel de Pekin were layed in 1900 AD. However it was not untill 1915 AD that the Hotel first opened on this location. At the Time it was housed in a Red Brick building. However since opening in 1915, no less than 6 renovations have changed every aspect of the Hotel. Right from the Start Business at the Beijing Hotel was booming. It instantly became the number 1 address for visiting Tourists and Travelers to Beijing, at the Time mainly well to do Europeans and Americans, among which many diplomats, bankers and businessmen. Simply find the Forbidden City aka Palace Museum or TiananMen Square on the Map. Go to Tian An Men Gate, then head East from Tian An Men Gate along East Chang An Avenue to find the intersection with Wanfujing Street. Gate and lies the worlds largest square TiananMen Square, the Square of Heavenly peace. To The North-West lie the extensive grounds of the Palace Museum and extensions. North and around the corner extends Wanfujing Shopping Street with its Historic Cathedral two blocks up from the Hotel. To the South accross Chang An Avenue lies the Foreign Legation Quarter, the former location of the International Embassies during the Colonial Days and until 1949 AD. The Hotel has seen numerous influential and international Guests. These are truely too many to mention and difficult to trace. We have however made an attempt to create a small listing with dates where possible. 1936 AD James Bertram, Foreign Correspondent. 1937 AD James Bertram, Foreign Correspondent. 1971 AD E. Grey Dimmond, Md. Each Year The Beijing Hotel proudly welcomes the Contestants for the Miss World Elections, who descend on Beijing for Press Coverage, shopping at Wanfujing and the traditional posing at The Great Wall of China at Badaling. still exists today as the B Building or "Middle Building" of the Hotel. This new wing of 1917 AD consisted of 105 suites furnished with central heating, telephone and toilet facilities. There were richly decorated dining halls and large kitchens, a hair saloon and a ballroom with a sprung floor. The opening of the new Wing of the Grand Hotel du Pekin was attended by well over 800 distinguished guests filling the lobby and dining halls to maximum. 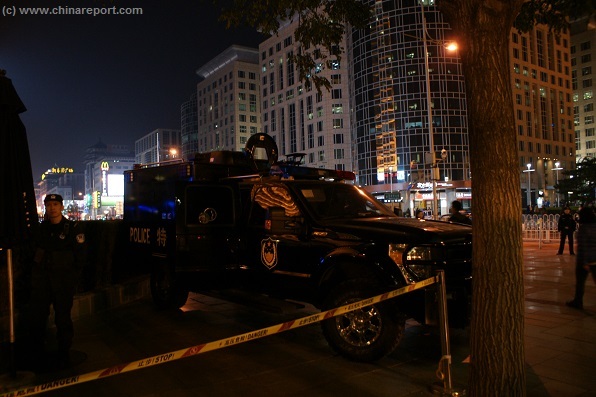 It was Grandiose Event in the smaller Beijing of the Time. Everyone of importance was there. (from Otis) smootly ferried the hotel guests to 7Th Floor bar and open-air terrace for dancing. The Dances at the Beijing Hotel became a main and weekly social event, quickly becoming the favorite outing for the local Elite. 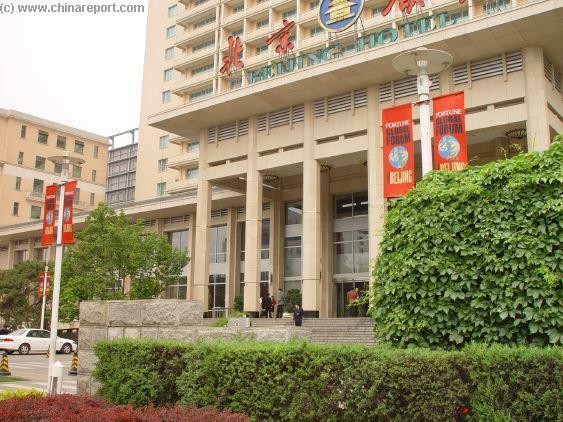 Foreign guests described The Beijing Hotel as the number one luxury hotel in the Far East or the Orient as it was popularly known at the Time. In 1954 AD a Third Renovation and extension brought a Third Wing to the Hotel. After 1949 AD, when Beijing once more the Capital City of China, tourism and business in Beijing were still slow, but the Beijing Hotel was selected by the Government of the Peoples Republic and the City of Beijing to be the prefered guest home of Foreign Dignitaries, Statesmen, Kings, Diplomats and the Like. In February 2003 the Beijing Hotel has been honored with the "Five Star Diamond Award" from the American Academy of Hospitality Sciences for its excellent service and facilities. (Capital Hotel, May 2006 AD). The Grandiose Traditional Pailou Ceremonial wooden Gate of the Grand Hotel at Chang An Avenue. 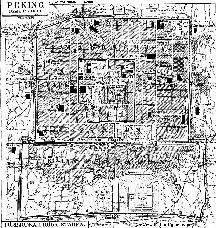 Schematic Map of the the City of Beijing in 1916 AD, shortly after the 1911 Xinhai Revolution. Beijing was modernizing and China was experiencing the industrial Revolution. Among the most noteworthy features of this Map are the QianMen Railway Station, at the Time the Main Railroad Station of Beijing. Born from the Colonial Era and a product of the first true penetration of foreign (western) influences in what was then still the Capital of the Feudal Empire of Qing Dynasty China (1644 AD - 1911 AD) , the Beijing Hotel is Beijing's Oldest and most Famous International Hotel. 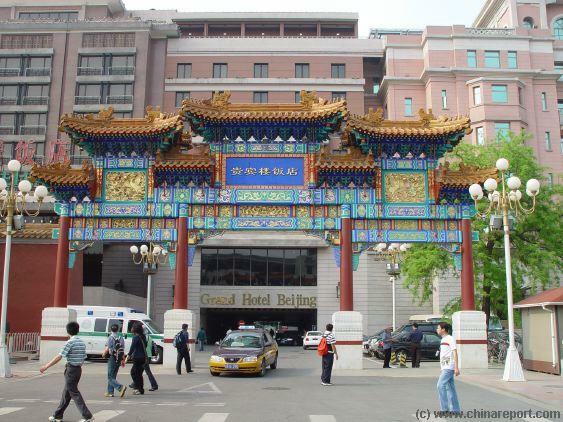 Originally founded and known as the Grand Hotel de Pekin, the Hotel later became the Beijing Hotel, the leading International Hotel in Beijing until this very day. 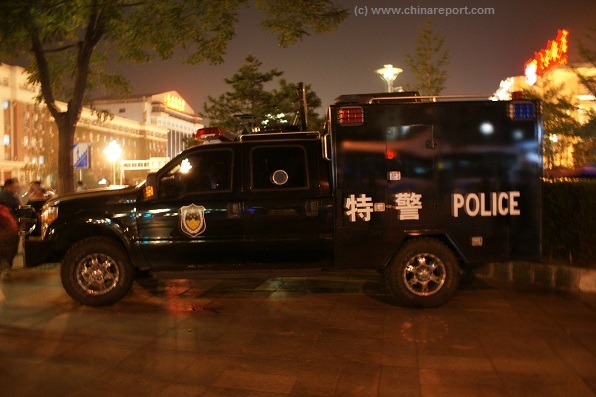 The Beijing Hotel however was a very different case. Situated at the center of Political and Internationally important things just up the street from the new Propaganda showcase TiananMen Square and adjacent Wanfujing, historically Beijing's number 1 shopping street, the location of the Hotel proved yet again perfect. It was the perfect place to host international diplomats, delegations and the accompanying press. At this particular location, they could be available (to Mao),at all times in view of what the Chinese wanted them to see, and otherwise perfectly under the control of their minders and hosts. Or so it would be until the year 1989. Front entrance of the Beijing Hotel as seen from Dong Chang An Avenue during the Forbes 500 Forum in Beijing in summer 2005 AD. 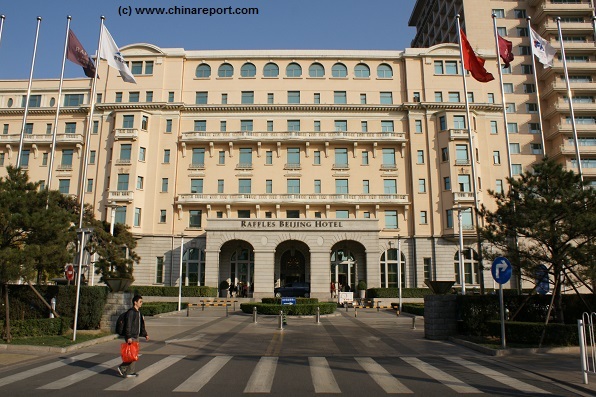 During the entire time of communist seclusion from international contacts and well after, roughly between the year 1949 AD and the year 2000 AD, the Beijing Hotel was the official and designated top ranking Hotel for the receiving of the highest ranking foreign officials. 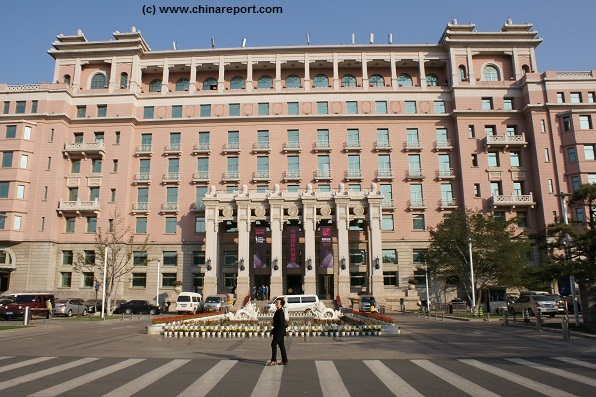 In the new China, the Beijing Hotel largely retains its previous function as the preferred Hotel for official international contacts and accompanying press, however of course the city and nation have modernized, leaving a multitude of other luxury Hotels available throughout Beijing today. 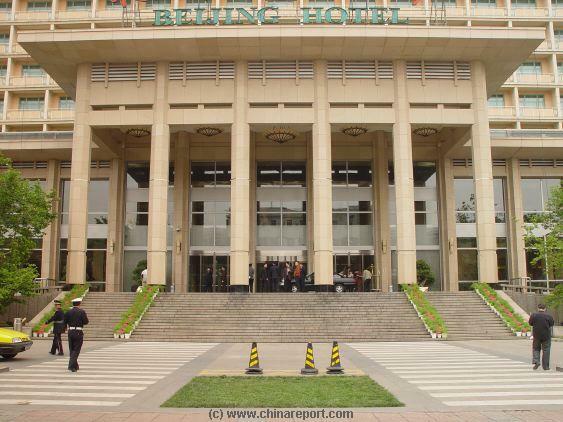 Although the Press now is no longer strictly confined to Hotel Beijing, high ranking visitors remain the rule rather than the exception at the Beijing Hotel and adjacent Grand Hotel Beijing (once more renovated 2009). Today those who flock to the Beijing Hotel are the internationally famous, well paid, the ultra-rich a variety of business people, severly upscale tourists and more.